September was a month of overload here . . . A few days off following surgery have allowed some time to catch up on the blog and post some of the highlights and unexpected detours from the past month. One pleasant surprise came at the end of the month, while visiting Columbia Mall. It’s rare for me to even go to the mall–these excursions are often so “frustrating” to me that I, alone or not, try to get what I came for and leave just as quickly as I arrived. It was a treat to actually stop in my tracks for a moment as I turned a corner to discover this exhibition. (Click here for the ManneqArt Brochure). 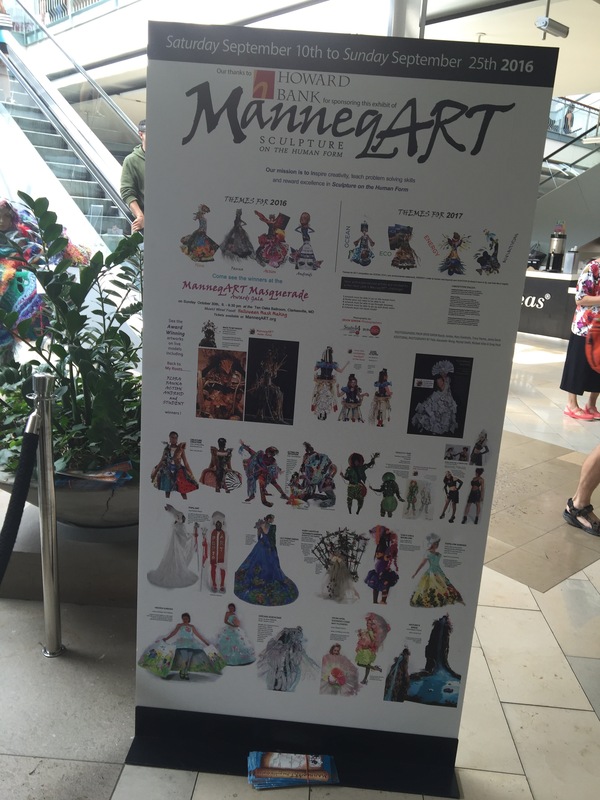 Based in Howard County, Maryland, ManneqArt is a local non-profit organization, promoting Wearable Art in a variety of events throughout the year. A description of their mission and work is available at: http://www.manneqart.org/. This free public exhibition was both unexpected and a bit shocking (at least for someone who doesn’t go to the mall very often) and yet perfectly placed, juxtaposing the anticipated and lulling popular / corporate designs and store-window mannequins with the sculpture, craft, art, fashion–the unique–surrounding a water fountain at the center of the mall. The objects on display were part of an open competition, working with themes in flora, fauna, action and androids. Among the designs on display, there was an imaginative brightly colored dress whose robe unfolded into a beautiful waterfall and a train that transformed itself into a pond with lily pads and a carousel dress complete with carnival tickets acting as a ribbon-bow and sash and clay animals revolving around the waist and a wood crank (to put this figures into action…?). One of my favorites was a piece by Amanda O’Shaughnessy entitled “Flowering Success.” The dress appeared to be completely constructed by paper, woven, folded, trimmed and hanging loose–papers, if one took a closer look, that were made from recommendation letters, applications and administrative forms, and various of “paperwork” (this word takes on new forms and meanings here) related to the college application process. The show was a reminder to me of the number of individuals and local community groups working in the Arts. And I wish I had more time and energy to promote all of these, or see all of them…to simply be aware of more of them. There is interesting work all around us, sometimes just around the corner unbeknownst to us. When working in the arts, it is so easy to be feel isolated, and it is a remarkable feeling to discover new work, new groups, and to understand and appreciate the efforts it takes to organize these events. So I guess I’m also saying I’m constantly amazed at how easy it is to feel inspired, uplifted. Sometimes all it takes is a trip to the mall. This entry was posted on October 19, 2016 by k.a.wisniewski in activism, Art, Baltimore, News and tagged exhibition, fashion, Mannequart, public art, wearable art.